Josh Malerman’s terrifying novel has been effectively adapted by Eric Heisserer, the talented writer of ARRIVAL and genre films like the underrated THE THING prequel and FINAL DESTINATION 5. In the time it has taken for this Netflix production to reach the screens, it has been preceded by A QUIET PLACE, which posits a similar apocalyptic scenario involving blind planet-conquering monsters. Malerman’s concept has the human race effectively blinding themselves to evade the creatures that spell their doom; while A QUIET PLACE revels in regular monster action, this achieves much of its impact by refusing to visualise the threat. 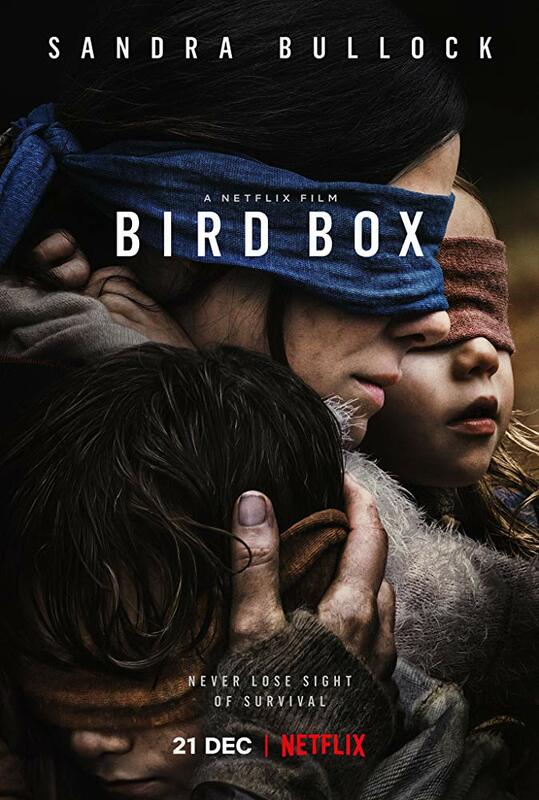 Framed by present-day scenes of a blindfolded Sandra Bullock and two kids in her care taking a perilous river journey to possible safety, this unfurls a series of flashbacks capturing the rapid spread of inexplicable psychotic behaviour and mass-suicides around the world. After alarming, visceral scenes of mayhem echoing THE HAPPENING and the first ten minutes of CELL, Bullock’s troubled artist takes refuge in the home of freshly widowed misanthrope John Malkovich, whose own wife has just walked calmly into a burning car. This film (and the book) has its lineage in much older horror fare – notably NIGHT OF THE LIVING DEAD – as it depicts a microcosm of humanity holed up in a single space arguing about the best way forward in a seemingly unsurmountable scenario. Practicalities like seeking out vital food supplies result in sweat-inducing suspense scenes, sporadic light relief (a post-apocalyptic supermarket spree) echoes DAWN OF THE DEAD and scene-stealing Malkovich drunkenly offers the most overt on-screen nod to Trump’s America: “All of us collectively are making the end of the world great again!” It’s a well-cast movie anchored by Bullock’s superb portrayal of one of horror’s toughest, most unsentimental (and dryly witty) heroic mother figures. Her riveting plight is punctuated by moments of true alarm and a highly suspenseful denouement before the film bows out with an optimistic end scene that, for once, doesn’t feel like a cop-out.